Because I believe in radical transparency and learning from (each other's) mistakes I will be sharing my experiences, stumbling blocks, frustrations, and successes in my new role. Below you will find part one about getting started as Employee Experience Chief (by the way, suggestions for a better name would be very welcome). In the past few years we at Organize Agile have used Holacracy as a way to share the burden of HR tasks over several colleagues. For us this proved too fractured, it resulted in too much time spent on meetings, and nobody giving HR the time and dedication it rightly deserved. A big mistake, as people are our most important assets and they deserve all the attention we can give. We experimented and learned our lesson, now it’s time to try an alternative: bundeling all HR related things in a single role, the Employee Experience Chief! In this role I am responsible for the healthy and sustainable growth of our organization. My goal is for my colleagues to be highly engaged, and enjoy doing their best work for our clients. This HR role did not just appear out of thin air. While assisting organizations in their transitions towards Agile organizations I was gradually drawn into the HR field. These transformations where usually characterized by a lack of involvement from the HR department. This surprised me so much that I decided to remedy this and write Agile HR (in Dutch) in 2017. The goal was to inspire and offer some practical tips to HR professionals in developing agility. During the past two years I have assisted many HR teams in their transition. Sometimes I would coach and facilitate HR teams in working in an Agile way themselves, using Scrum, Kanban, or Agile Portfolio Management, always aiming to develop the Agile mindset. In other cases I would concern myself with HR’s role in the Agile transformation; the development and use of Agile HR instruments and tools and facilitating the development of self-organizing teams. How can I gain an insight into how everyone is doing? Ready to go? Well not really, because where to even get started? My head is overflowing with ideas, and if that’s not enough my colleagues are happy to add their own. Back to basics: a backlog. On the basis of all ideas and our employee journey we start our product backlog using my colleagues to add to and prioritize it. They are my stakeholders and are the only ones who can reliably tell me whether I am adding value. By putting them in the customer/stakeholder position I hope to achieve that they will be involved in what I do for them, and I won’t spend my time on things they don’t see the value of. I highly recommend doing regular backlog grooming with your ‘customer’. The quality of the backlog increases massively with the questions they ask. How can I gain insight into how everyone is doing? To help us achieve the first goal we create a buddy system. Colleagues are perfectly able to help and support each other in their needs, it does not require my personal intervention. Every colleague picks a buddy and determines their coaching frequency and what they can expect from each other. This is their own responsibility. We also closely link this to development. That’s a subject for a different blog. To help gain better insight into team morale we do regular retrospectives. I am embarrassed to admit that in the past few months we had grown sloppy. Busy calendars were used as a poor excuse. While nobody in our line of work needs to be told the importance of retrospectives we still prioritized other matters. Fortunately retrospectives are now back on our regular schedule. 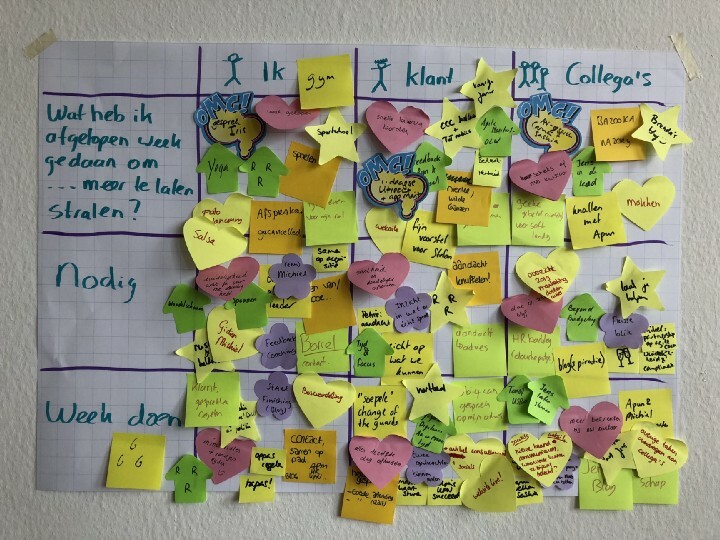 With our clients we have been using the team morale metric (credits go out to Christiaan Verwijs) regularly and we have now also made this a fixture of our own team meetings. It provides us with quick and regular insights into how everyone feels about their work, on the basis of which we can take action. Our team morale metric consists of four questions we ask team members every week. In (Scrum) teams this metric has proven to be a good predictor of future team productivity. If team morale drops you may expect the team to start missing sprint goals and add less value. My first two months as Employee Experience Chief have be fun, instructive, tough at times, but primarily energetic. Responses have been mixed: The buddy system was adopted and executed immediately, the team morale metric was embraced, but there was also feedback (and pushback) to for instance documenting the holiday schedule (‘that’s not agile’). I will energetically continue to improve our team using small steps. The next few months are all about creating more transparency and clarity (by setting up an interactive personnel handbook among other things) and, with to further company expansion in mind, to improve our onboarding process.